Conversations among friends and between strangers fueled my pumping obsession. Every time I thought I was ready to skip a session or wean my son, I felt this peculiar sense of failure. "Not yet..." nagged a little voice. I'd ask other people how their feeding was going and then persist with my own despite my frustration and annoyance. I also made the crucial mistake of reading popular parenting blogs where I'd see talk of only weaning well past the 12-month mark. I feel like I passed the first parenting test and when people converse about infant nourishment, I feel proud stating that I did whatever it took to give him the "best" start. Over the past few years there's been an increasingly intense push toward breastfeeding. We're taught in prenatal class that "breast is best" and encouraged to keep it up until yuor kid is at least two. My prenatal instructor boldly and proudly wore the badge of breastfeeding all of her kids until four years of age. Now, don't get me wrong -- I am not against this resurgence of 1970s hippie-mom culture. In fact, I'm one of those women casually feeding their baby in the park, on a patio, in an airport and so on. Cue the Grateful Dead and scratch n' sniff scent of cannabis. But as a woman who (truthfully) never really aspired to have children and cringed at the thought of using my own body as a food source, I'm at a loss as to how I ended up here. Hi! My name is Angie and I'm a pumpaholic. Wait... What? Let's start at the beginning shall we. For the first five months of my son's life, I struggled to feed him. 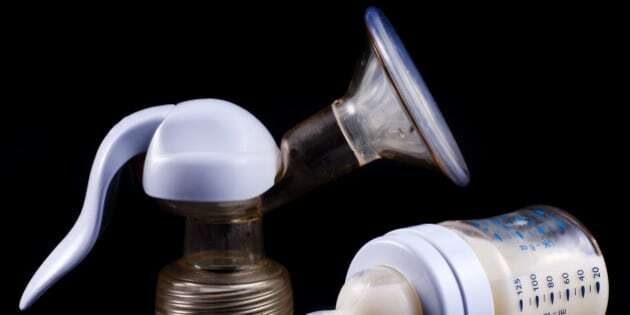 I tried the advice of numerous lactation consultants, finger tube feeding, bottles and formula. Food simply did not motivate my baby. As my body responded by "drying up," I spiralled into a frenzy trying to figure out how to get him the best nutrition (which subconsciously meant breast milk to me). So began my life attached to my Medela pump, living off of a fenugreek/blessed thistle and domperidone diet (that's domperidone, not Dom Perignon, so don't get excited). Call it a result of passive peer pressure or competitive mom culture, but either way, I ended up pumping six times a day for eight months -- that's 1440 times connecting to my machine, 3600 hours listening to the eeee errr eeee err sound, 127 freezer bags filled and 2880 bottles served. Phew! Somehow, the monotony of it all morphed into zombie-like compliance and addiction. I never missed a pump. Playdates began and ended based on my "feed" schedule. Extra sets of equipment were ordered, sterilized and on standby at all times. I set up a pumping station in every hotel/home I stayed in and even pulled out the pump in the cramped quarters of quite a few airplanes. It got to the point where I stopped being discreet. I'm pretty sure that more people have now seen my breasts than those of some adult film stars. I set short term goals to make the pumping manageable -- at first, I aimed for seven months. Then it was 10 months and finally 12 months. Ultimately I weaned at 13. I ended up getting into such a formulaic routine that I didn't even notice how restrictive my behaviour was until I slowly started cutting back on pumps. While I'm sure some of the peer pressure was all in my head, there's no way anyone can deny judgement between moms. Invariably, amidst most playground chatter, someone enters the territory of breastfeeding versus formula. Personally, I don't understand the divide. Some of my best friends exclusively formula fed, others mixed it up, and some exclusively breastfeeding. Regardless, our kids are perfectly healthy, happy nuggets. But, I digress. Inevitably, when moms get together questions arise about latch, length, schedules and so on. Some women take pride in serving formula right out of the gate while other moms cautiously confess they're still breastfeeding their four-year-old. Whatever the case, the reality is that most mothers feel the need to defend their choice. I struggled to come up with rational reasoning as to why I went my ridiculous route and waved off casual suggestions that I stop pumping. The bottom line is that these conversations among friends and between strangers fueled my pumping obsession. Every time I thought I was ready to skip a session or wean my son, I felt this peculiar sense of failure. "Not yet..." nagged a little voice. I'd ask other people how their feeding was going and then persist with my own despite my frustration and annoyance. I also made the crucial mistake of reading popular parenting blogs where I'd see talk of only weaning well past the 12-month mark. When all is said and done, I am glad I went the route that I did despite aggravations and restrictions. I feel like I passed the first parenting test and when people converse about infant nourishment, I feel proud stating that I did whatever it took to give him the "best" start. While I'm sure this post will spark comments around breastfeeding versus formula, I'm really just hoping there's reflection on why the debate even matters. Parents should do whatever feels right for their own family/circumstances. In the end we all win if our kids are going to bed satisfied.